Bring the chicken stock to a boil and pour over the dried poblanos and cherries. Let steep for 15 minutes. Finely dice half an onion and sauté in a little oil until they just turn brown. Chop one small tomato. When the chiles and cherries are soft, remove the chile stems and seeds. Add the chiles, cherries, stock, onion and tomato to a blender and blend until very smooth. Season to taste with salt. In a sauce pan, heat a tablespoon of oil till almost smoking, then add the mole sauce (careful, it sputters). Sauté briefly in the oil, then reduce to a simmer for 10 minutes. Roast the fresh poblanos over a gas flame or under a broiler until the skin is charred all over. Place in a bowl and cover with a towel to steam. When cool enough to handle, remove the skin. Gently slit open one side of each chile and remove the seeds, being careful to keep the stem and chile intact for stuffing. Set aside. Finely dice the bacon and onion. Mince the garlic. Chop the chicken into small cubes. Sauté the bacon and onion until soft. Add the chicken and cook through. Add the garlic at the end, along with the cumin. Salt and pepper to taste, then remove from heat. Reserve a 1/4 cup of goat cheese for the topping, blending in the remaining cheese until creamy. In a sauté pan, heat the canola oil until hot. Add the cereal or tortilla chips and almonds and sauté until fragrant. Turn down the heat to low and add the smoked paprika and salt, tossing quickly to combine. The paprika may smoke a bit. Remove from heat and empty into a heat proof bowl. To assemble the dish, pour the mole sauce into a casserole dish big enough to hold the four poblanos. Carefully stuff each poblano with 1/4 of the chicken filling, then lay them on top of the mole. Top each chile with the cereal topping, then with a sprinkling of goat cheese. Bake in the oven at 400 degrees until the mole is bubbly and the goat cheese is light brown on top. 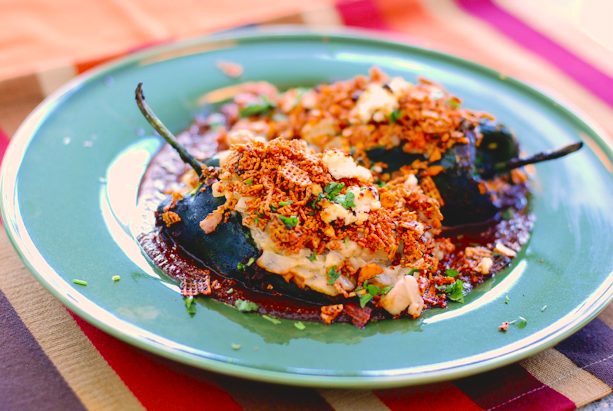 To serve, lift out the stuffed pepper onto a plate, spoon mole around the pepper. Sprinkle with any extra cereal mix and a bit of cilantro. Related Blog Post: Sour Cherry Season is Here!